Aurora Cannabis is looking beyond its portfolio of cannabis products and investing significantly on another plant that promises to diversify the company's product lines and market offerings. "We see enormous opportunities around the world for hemp," Aurora's chief corporate officer Cam Battley tells Grow Opportunity in an interview. The second largest cannabis producer in Canada recently announced its acquisition of two big players in the European hemp industry: Agropro and Borela. Aurora also owns a majority stake in Hempco, a producer of hemp-based products based in Vancouver. Agropro is a hemp seed contracting and processing company. It's sister company Borela is a processor and distributor of organic hulled hemp seeds, hemp seed protein, hemp flour and hemp seed oil. Canada's hemp industry got a significant boost this year when Health Canada announced an exemption, which allowed for the utilization of the whole hemp plant for commercialization, previously prohibited under old regulations. This exemption is in effect until the Cannabis Act takes into effect on Oct. 17th, which would allow for whole plant utilization for hemp. Hemp is a potential source of low-cost CBD, notes Battley. "But more than than, it's a very interesting product in its own right in that you can use the fibre to make everything from paper to clothes to buildings – and do so on a very inexpensive basis." Hemp is a hardy plant that does not require too much water or as much care as its marijuana sibling, and can be grown outdoors. The plant has many known uses and can be developed into many product forms, including oil, plastic, paper, construction materials, clothing, and even fuel. Aurora also sees great potential for hemp as a source of non-animal protein. "Demand for non-animal protein is growing very rapidly around the world, especially in Asia," Battley says. "Looking ahead at the population of the future, we will simply not have enough land to get all the protein from animals." With the acquisition of Agropro and Borela, Aurora intends to "extract, refine and productize the organic hemp biomass into a wide range of organic CBD-based wellness products to generate new and significant revenue streams in this burgeoning market," the company said in a statement. Battley believes global opportunities for cannabis will continue to expand and the medical market will be the catalyst for that. 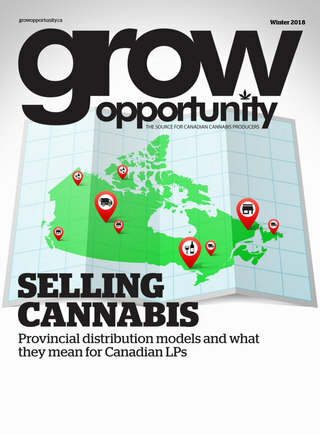 "The thing about consumer legalization is that it's happening at the same time as major catalysts in this industry, including the opening of multiple medical cannabis systems in additional countries," he says. "It's like there's a cascade of new markets opening up for leading companies like Aurora and Canopy and a few others." The Aurora executive also believes medical cannabis has played a significant role in changing the way people feel and view cannabis, and has helped lessen the stigma around marijuana use. "The reason why social attitudes have changed so much with respect to cannabis, in part, is because we've had a medical cannabis system that has worked very, very well," Battley explains. "So many Canadians now – 350,000 – have a friend or family member who has used medical cannabis successfully for the management of symptoms of a health condition. And that tends to change attitudes. I think experience will continue to destigmatize it." It's also why Battley believes many of the countries that have legalized cannabis in some form or another have generally started with relaxing regulations around cannabis for medical use. Medical cannabis, he says, will increase the comfort level with cannabis and eventually create opportunities for legal, adult recreational use –as what happened in Canada. Despite its aggressive push toward international markets where cannabis is legal, however, there are no plans for this Edmonton-based company to shed its Canadian roots. "Our intention is to be around and build that global leadership from Canada," Battley proclaims during his keynote at the recent Grow Up conference in Niagara Falls.